You have correctly activated your bike guarantee . Introduce your date to create your account in BH Bikes. If you are already registered in BH, login so we can recall your data and you do not have to complete the form again. Where can you find the serial number? Why do you choose this bike? How would you describe your riding style or preference? Do you have another bike? Is that bike a BH? Where do you get informed about the purchase of your bike? I have read and accepted the terms and conditions and the data protection policy. 1. The lifetime warranty is applied only to those BH frames sold in authorized BH points of sales. a. The purchaser should register the warranty online, duly completing the information, within 30 days of the date of the purchase. b. This warranty is not transferable, and it terminates upon transfer of the bike to a third party. For the purposes of this warranty, the original purchaser is understood to be that individual registering the warranty at the moment of the purchase, with the warranty not being applicable to any individual other than the original purchaser. c. Perform all maintenance operations on the bicycle in a BH-approved establishment, following the requirements as indicated in the manual. All maintenance operations should be noted in the corresponding service sheet of the bicycle’s user manual, duly completed in the BH point of sale. a. Rear stands of double suspension models, children’s bicycles, and any defects in paint or corrosion. b. Defects or damage caused by an accident or improper or negligent use of the bicycle. c. Assembly of components or accessories that are not compatible with the intended use of the bicycle. d. Defects caused by improper handling. e. Defects caused by normal wear of the bicycle, including those caused by material fatigue. Damages due to fatigue are symptoms of normal use wear of the frame. This is a normal type of wear, and therefore it is the user’s responsibility to periodically examine the bicycle. f. Defects caused by improper maintenance operations. g. Bicycles that have been used for competition, demo or rental. a. Acceptance of this warranty is ultimately subject to the decision of the BH Bikes Service Technician, upon conducting a specific analysis in order to determine the nature of the breakage and/or defect. b. In no case shall this warranty cover personal damages that may result either directly or indirectly from failure of the same during its use. c. The customer will be responsible for shipping and labour costs generated by the application of this warranty. d. During the validity period of this warranty, BH will repair any defective frame or part, or, if they so choose, replace the part or frame with another of the same model or from the most similar model available, with the exception of any component substitution made with pieces that are not compatible with the substituted part. 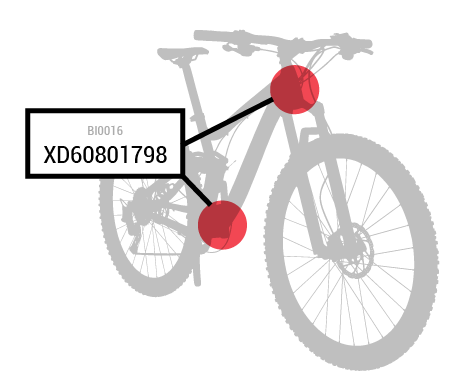 e. The extension of this warranty will only be valid for bicycle lines posterior to 2014.
f. All claims subject to this warranty should be channelled through an official BH distributor. g. Limited to 10 years which is a bike service life. h. Only will be replaced or repaired the bike frame. In BH BIKES EUROPE, S.L. (hereinafter BH BIKES) we are committed to protecting the privacy and ensuring the proper use of the personal data that we process and which you provide to use, both online through this website and, where applicable, any of its subdomains, microsites and/or mobile applications, and offline. - Your contact details, including your full name, your address (billing or delivery), your date of birth and email address and, optionally, your telephone number. We need your email address and (optionally) your telephone number so that we can contact you if we have a question or information about your order. - If, in order to participate in any event, activity, promotion or competition organised by us, you send us a video or photographs or any other form of text or audiovisual content (articles, drawings, etc.) protected by industrial or intellectual property rights, the sending of such content implies authorisation by the sender for BH BIKES to use it on this website, and therefore to make it available to third parties, and in any of our social media profiles, and on YouTube to provide information about any event/activity, to document it, and include it in a photographic/video report relating to it and on any advertising leaflets, posters, printed material and promotional signs, etc. Therefore, you assign to BH BIKES, non-exclusively, free of charge and for an unlimited time and worldwide, the sublicensable right to reproduce, distribute, translate, publish and disclose all or part of such content by any means currently known or developed in the future, for any purpose. The copyright of such content belongs to its author, who warrants such authorship. However, sending us this content or placing it on our website or social media channels implies the assignment of the right to reproduce and publish this content, with the author reserving their right to exploit it in any way that does not conflict with the normal exploitation of the work by the aforesaid means. - The sender warrants that they are the owner of the content or that they have all of the rights, capacity and/or permissions necessary to license said content and that it does not infringe the rights of any third parties, including any industrial and intellectual rights, and they are responsible for obtaining any public or private authorisations and making any payments for the rights to use any intellectual and industrial property rights that may be necessary. The sender shall be solely liable for any claims filed by third parties, including the Public Administration, in relation to the content and ownership of such content, and for any resulting losses or damages that may be incurred by BH BIKES EUROPE, which is expressly authorised to take any action permitted by law to protect its rights. You are responsible for keeping your data and profile accurate and up-to-date, with BH BIKES held harmless from all liability if you fail to do so. - To maintain contact and communication with you, to manage the contractual and/or commercial relationship, including after-sales and warranty services, to manage any requests that you send to us online and, where applicable, so that you may be invited to, register for and/or participate in the activities or events promoted or organised by BH BIKES. We also inform you that at these events and activities, photographs may be taken and/or videos may be recorded and these may be published on this website, on any of our social media profiles and on YouTube, to report the event/activity, document it and to be included in the photographic/video report on it. - In order to offer you, develop, personalise and improve our products and services based on your interests and to improve your user experience, we will create a “commercial profile”, based on the information provided. Automated decisions will be made based on said profile, applying criteria such as your geolocation - to inform you of prices in your country or to direct you to your nearest store - your purchases in our online store and/or in BH Bikes' physical stores, your use of loyalty programmes, your ratings and assessments of products, your record of contact with our customer services department, your newsletter open rates and clicks, your browsing behaviour (web tracking), the types of newsletters to which you are subscribed, your participation in promotions and events and your use of our mobile applications. - To assess your creditworthiness, for which you authorise BH Bikes to contact third parties such as financial institutions, credit score and credit rating companies, etc. to request additional financial and property data that may be necessary to complete the information regarding your creditworthiness. I would like to receive e-mails from BH containing its latest and exclusive news.